Women from the Far East have long known all the benefits of consuming rice for good health and slim figure. However, it is no less powerful even when it comes to skin care. Did you know that rice is considered as healing in cosmetics by women for centuries used in the care of their skin, but is especially is appreciated the Japanese beauty. It is rich in B group vitamins which are stimulating the growth and regeneration of cells, slow down their aging and improve blood circulation, and that’s all that women need for a dazzling appearance of the face. 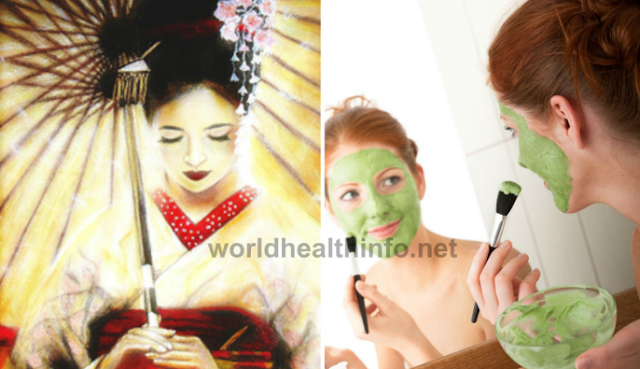 That’s way the controversial geisha’s, ​​in order to maintain flawless skin and prevent premature aging, regularly use a mask of rice. It is a healing mask made of white rice, milk and honey that deeply hydrates the skin. Contains antioxidants and creates protection of the surface against ultraviolet rays, which prevents the creation of pigmentation. After its use, the skin becomes soft and velvety, and the tan lightened and shinny. Here’s how to make this miraculous face mask. Two to three tablespoons of raw rice put in cold water and cook it until they become soft. The liquid from the boiling, will later also be used, so keep it, strain the rice and place in a separate bowl. Washed the boiled rice with lukewarm water and add a tablespoon of warm milk. Stir the mixture until you get a homogeneous mixture and add one tablespoon of honey. Apply the mask in a thick layer on your damage skin and neck. Keep it on your skin for half an hour, after that remove the mask probably the best is with wet towel, wash your face with the liquid from the boiled rice. The remain liquid use it to make ice cubes, which later can be used for face massaging.